Spring has arrived and summer's coming soon, yet still all too slowly. Here at iSoaker.com, we've completed most of our testing of the new notable water blaster products of 2016 and are summarizing our findings for you. While the specific review pages (see also: the listing of Water Gun / Water Blaster Product Analyses) go into more statistics and details about particular water blaster models, this article should provide a good overview of what to expect from the blasters examined here. If you just want to know our choice for the best, scroll down to The Verdict. Otherwise, read-on to learn more about all the contenders and understand better why one ended up rising to the top of the field for summer, 2016. 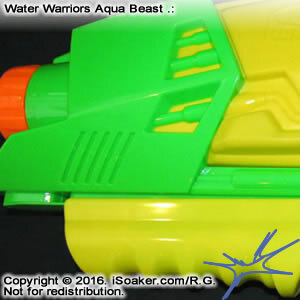 The Water Warriors Aqua Beast is a simple, solid pump-action water blaster featuring a nozzle selector with three settings and a rather large reservoir for its size. The nozzle choices vary between two stream settings and one burst setting. Granted, being a pump-action water blaster, producing longer, continuous streams is not possible. Reminiscent of a larger version of a Water Warriors Avenger (2008), it is expected to perform similarly to the Water Warriors Drench Master (2015), though offering more shots per fill thanks to its bountiful reservoir supply. However, actual testing has not been done, yet, but this may change as the weather gets warmer. The Water Warriors Aqua Wheel is a small, pump-action water blaster featuring a large pinwheel-like feature. The wheel spins with every full pump, but does not require water to operate nor does it significantly affect stream production/performance. Interestingly enough, it is easier to make the wheel spin more consistently when the Aqua Wheel is loaded and pumping water as opposed to dry pumping air through the system. Aimed at younger users, the spinning wheel actually tempts kids to try to pump faster in order to make the wheel spin faster, but also resulting in harder hitting streams being produced. The reservoir supplies a decent amount of water, providing over 100 pumps-worth of water on a full fill. While not a heavy-hitting water blaster, the Water Warriors Aqua Wheel actually makes for a good, fun training water blaster that can be used with or without water. The Water Warriors Argon (2016) is a remake of the original Water Warriors Argon (2005). Both the Water Warriors Argon and Xenon were re-released for 2016 with a slight change to the pre-pressure system swapping in a lever on the side in place of the previously positioned button. As the Xenon (2016) performed virtually identical to the 2008 model, the 2016 Argon has not been further tested and its performance is presumed to be identical to the original Water Warriors Argon (2005). The Water Warriors Barbarian is a pump-action water blaster with a spring-based pressure capacitor chamber akin to the original Water Warriors Stready Stream. Performance is currently predicted to be identical to the original Water Warriors Stready Stream, though the Barbarian's capacity appears to be a little larger, allowing it to last longer on the field. Presently, though, the Water Warriors Barbarian has not been further tested, yet. The Nerf Super Soaker Bottle Blitz (2016) is a remodel of the original Super Soaker Bottle Shot (2008), but remains a pump-action water blaster that is able to accept a variety of standard-threaded bottle types. Unlike previous variants, the 2016 Bottle Blitz's bottle attachment point is at the bottom of the forward pump grip. This makes the 2016 Bottle Blitz's center-of-gravity much lower, but also much more forward heavy. Based on nozzle size, performance it presume to be on par with the original, though actual testing has not been done at this point in time. The Nerf Super Soaker Breach Blast is a simple, pump-action water blaster. Based on its technology and nozzle size, the Breach Blast is predicted to perform similarly to the Nerf Super Soaker Freeze Fire (2014). No further testing is planned on this model for now. The Water Warriors Gargantua appears to be an air-pressure or elastic-diaphragm-based water blaster, but it is actually a fully functional, albeit small-chambered full elastic bladder-based blaster. With good reservoir capacity, three useful nozzle settings, a decent pump, and fast pressurizing time, the Gargantua provides solid performance. The Gargantua also features a nozzle selector with three different, yet useful settings to provide versatile functionality on the field. Its main shortcoming is the rather small filled volume of its pressure chamber that offers slightly more pressurized water volume than a 2006 Super Soaker Defender or classic 1998 Super Soaker XP 70, the fact that the Gargantua's chamber is a full elastic bladder means that power and stream consistency is high despite its total volume being lower for a water blaster of its size. Moreover, though the pressure chamber volume is low, this also means it is recharged quickly, able to blast again with little effort. As such, the Gargantua can keep pace even against larger elastic-based water blasters. The Nerf Super Soaker H2Ops Squall Surge is a small air-pressure blaster water blaster. Using pressurized reservoir technology, performance is decent for a light calibre air pressure water blaster, but its completely filled (overfilled) reservoir volume is less than that of the older Super Soaker SC Triple Charge (2000). Given that the reservoir should only be filled 2/3 to 3/4 full, actual useful capacity is limited. Its back-heavy design and mid-mounted trigger makes one naturally want to angle the nozzle upwards, though also making the blaster not feel quite balanced in one's hands. Functionally, it works, but for a "Super Soaker", there is much room for improvement. Then again, it is nice to see Hasbro at least bringing back pressurized water blasters to its line-up. The Water Warriors Thresher is a light, pump-action water blaster. The Thresher uses a similar pumping mechanism to the 2008 Water Warriors Hydro Blast, but offer much more water capacity. Nevertheless, this light, easy-to-operate water blaster is good for younger users offering plenty of light blasts on a single fill. The Nerf Super Soaker Tidal Torpedo Bow is a pump-action water blaster with composite-bow-like styling. Similar to the Nerf Super Soaker Tidal Torpedo 2-in-1, the Tidal Torpedo Bow can be used with or without water and with or without its foam rockets. Unlike the Tidal Torpedo 2-in-1, the Tidal Torpedo Bow has an on-board reservoir. This model has not been further tested yet. The Nerf Super Soaker H2Ops Tornado Scream is a light air-pressure-based water blaster featuring dual stream blasting functionality. Though larger than the Nerf Super Soaker H2Ops Squall Surge and sporting a larger reservoir, since the Tornado Scream also relies on pressurized reservoir technology, it does not provide significantly improved performance. Moreover, there is no way to select whether both nozzles are active or not. As such, every blast creates the centered stream together with an angled secondary stream that rotates about the center stream (at varying speeds depending on the available pressure and duration of the blast). This makes it more difficult to aim accurately and the secondary stream is more likely just wasting water than actually being useful for soaking one's target. In the end, the usefulness of the Tornado Stream is diminished by its always-on novelty feature. The Water Warriors Xenon (2016) is a remake of the original Water Warriors Xenon (2005). Performance of the Xenon (2016) appears to be comparable to the original with the primary difference between the two models is the change from the previous push-button toggle to the lever-based toggle switch in the 2016 version. Unfortunately, though the lever is clearer to use than the buton, the fact that the body design remains the same means that the Xenon (2016) has the same, limited space trigger-grip region as the original; those with larger hands will find they have no space for their pinky. Pump lag is also notable and while stream performance is decent, other modern water blasters perform as well if not better and lack the pump lag and ergonomic problems that the Xenon (2016) has. While the "Pre-Charge" technology offers advantages over typical air-pressure-based water blaster technologies, this technology would definitely benefit from a better water blaster design. This year, once again, the answer very clear. Again, while two blasters in the 2016 Nerf Super Soaker line show some promise, Hasbro still has not figured out what a "Super Soaker" is meant to be while the ones who actually brought the world the Super Soaker (now Alex Brands Buzz Bee Holdings LLC) show that they still strive for better performing water blasters. Though Buzz Bee Toys Inc. re-released two air pressure-based water blasters and released one new elastic pressurized water blaster in 2016, the Water Warriors Gargantua is, without a doubt, the Best New Water Gun / Water Blaster for 2016. While more slender than the 2015 Water Warriors Waterlord, the Gargantua offers good capacity and better stream performance. With three stream settings to choose from and great effective range, the Gargantua can easily outperform any other water blaster currently on the market. Of course, that does not mean there isn't room for improvement. Looking back at the Evolution of the Water Warriors Elastic-based water blasters, the Gargantua is decent, but still not as hard hitting as the Water Warriors Sphinx, Water Warriors Gorgon (HP), or Water Warriors Vindicator. The Gargantua's pressure chamber volume is also quite low with only the spring-based elastic water blasters offering lower firing chamber volume. Of course, what cannot be stated enough is that hopefully that, together with Water Warriors Waterlord, the release of the Water Warriors Gargantua continues to mark the return of elastic-based water blasters. With the main CPS patents expiring, we can only hope that Buzz Bee Toys Inc. continues to experiment and improve their elastic-based water blasters. Moreover, it would be nice to see other manufacturers as well upping their game since healthy competition promotes developments.